All the finger labyrinths I make are based on the 11 circuit labyrinth design most popularly seen in the Gothic cathedral at Chartres in France. They range in price from the smallest (around 7" wide) at $20; Medium (around 12” to 13” wide) at $45; and Large (18” to 20” wide) at around $90 or more. ( larger costs more as at that size, the layrinths are more likely to crack with the stress. Labyrinths are a potent symbol in many cultures and have been for thousands of years, predating Christianity. 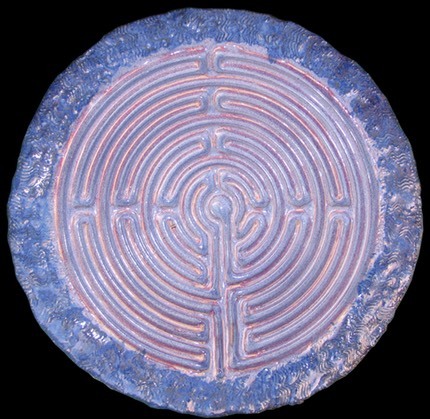 In fact, the earliest positively dated labyrinth is from 1230 BC found in Greece. 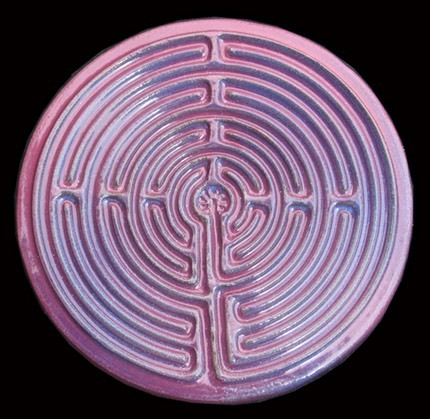 The precursor to the labyrinth is the spiral, linked to the circle. Ancient symbol of the goddess, the womb, fertility, feminine serpent force, continual change, and the evolution of the universe. 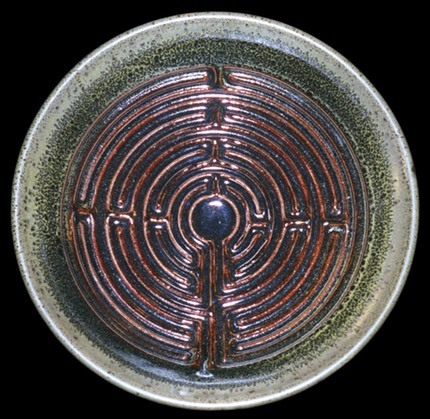 Labyrinths are found in many cultures, from Crete and the Minator to Aztecs and Native Americans to turf labyrinths that still exist in England, Germany and Scandinavia. 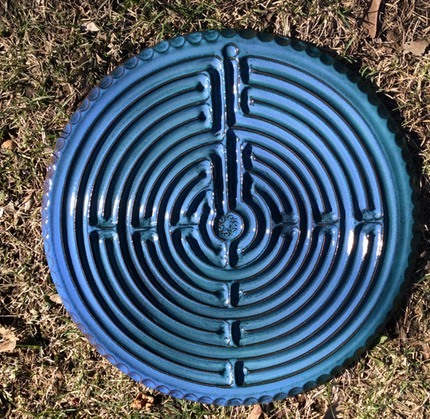 The patterns of the labyrinth are similar in design and conception to the mandalas of Buddhism, which are physical representations of the spiritual realm designed to aid in meditation. 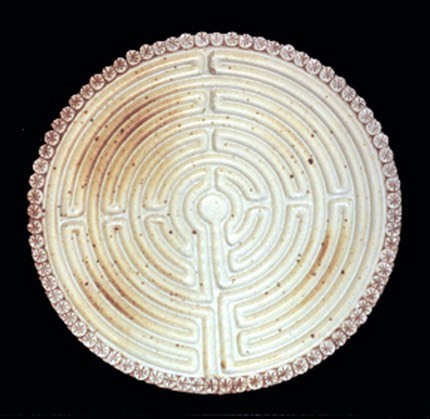 The walking labyrinths are similar in practice to the Japanese Zen practice of Kinhin, or “walking meditation.” Many oncologists are using labyrinths with their patients to help them focus on the healing aspects of positive thought. 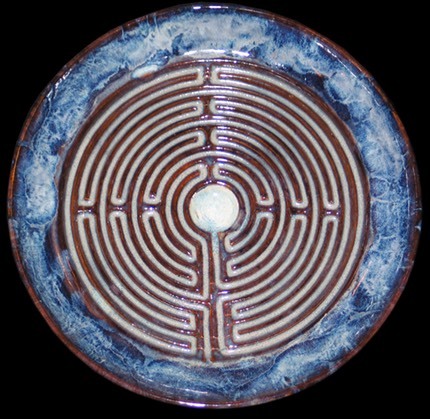 Labyrinths are not only gaining in popularity with the “New Age” crowd but many mainstream religious organizations are creating labyrinths as a path to deeper prayer and faith. 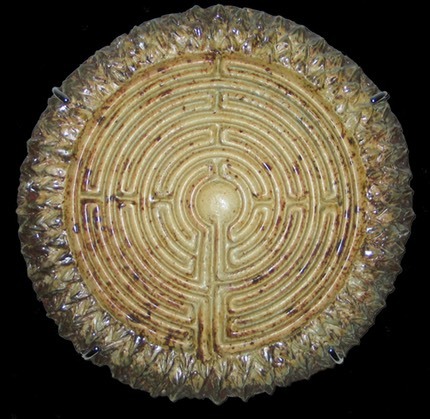 My labyrinths serve the same basic meditative function of the larger walking labyrinths except with mine, like using the yellow pages, you let your fingers do the walking. I’ve created several sizes of labyrinths, from the really large version where the finger fits easily to smaller “fingertip” types. Most are flat, but I’ve created several in shallow bowl shapes. 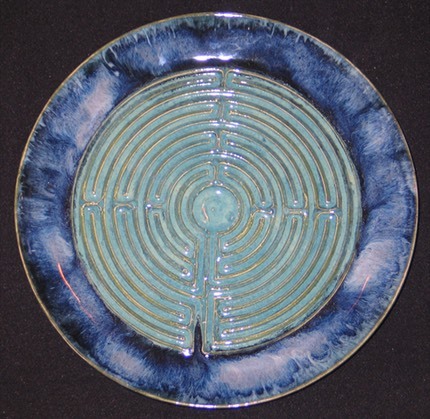 I even have a “travel labyrinth” size perfect to fit into a briefcase or travel bag, also doubles as a hot plate. 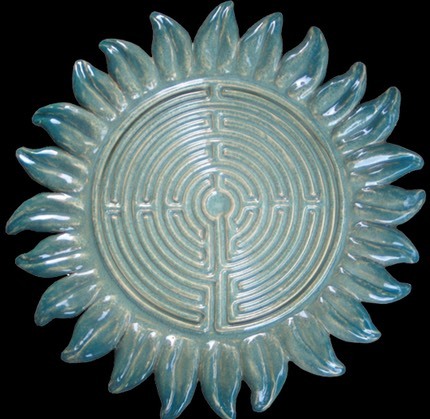 Whether in spiritual or meditative use the labyrinth symbolizes the path to be followed, however long and complex, to reach the goal, the object of the quest, at the center. What that goal is, and how you use the labyrinth is up to you.